Mass Index (MI) is indicator in technical analysis developed to identify trend reversals by measuring range between high and low prices (narrowing or widening). In calculation is used exponential moving average EMA applied to subtraction of high and low values. For period of EMA is used value of 9. For n parameter is usually used value of 25. 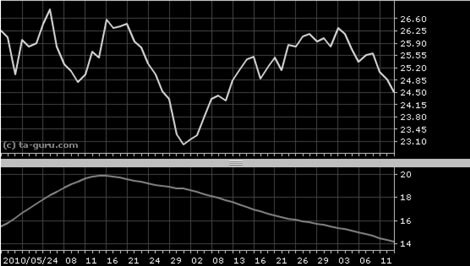 When value of 25-period mass index rises above 27 and than falls below 26.5 it is signal for trend reversal. Open chart for google with mass index.